The Dataprobe COE-8O is the Output Unit for the COE-8 Contact Closure Transport over Ethernet system. The COE-8 is a system for transporting switch closure information over a TCP/IP network. The COE-8 consists of two devices, and Transmitter Unit (COE-8I) and a Receiver Unit (COE-8O). The COE-8O has eight relays that will mirror the status of the eight inputs of the COE-8I. Each unit can be monitored and configured from a Web Browser. 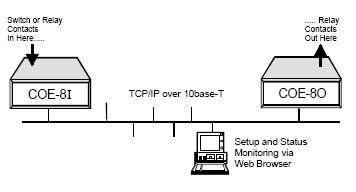 The COE-8 system also supports SNMP for independent monitoring and control. Up to 4 SNMP managers can be configured to support the COE-8.